I have had my 12 week old male kitten for about a week. I love him to pieces, but he seems a bit smelly. The breeder said she bathed him the day I picked him up, and I gave him a bath 3 days later and he smells again already. He smells a little like poop, and I have checked his behind and don't see anything. Is it okay to give sphinx kitties a rub down with a baby wipe between baths? Hey there! This comment is about 5 years late, but I'm giving my input anyways! I like using cat-specific, unscented & hypoallergenic wipes (unscented baby wipes work too though) for little cleanups after messy trips to the litter box. I use the wipes on the paws, tail, or wherever else they may have gotten stool. If the **** is poopy, I use a tissue to clean, not the cat-wipes. I've found my cats do best with baths every 2 weeks, but if they get oily or smelly between baths, a bit of a wipe-down wit the cat-wipes can help. Whoops, sorry for the censor! 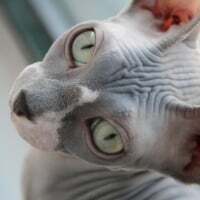 The word is just the cat's bottom- I try to avoid putting chemicals (that wet wipes may have) directly on my cats' bottoms but since the Sphynx breed is known for intestinal problems, messy litter-box trips happen from time to time (if they happen regularly, bring your cat to the vet!). Does anyone else have thoughts on using baby wipes versus cat-specific wipes on this breed?